Rate of change of Gross domestic product, world and OECD, since 1961. Economic Growth is the increase in the inflation-adjusted market value of the goods and services produced by an economy over time. It is conventionally measured as the percent rate of increase in real gross domestic product, or real GDP, usually in per capita terms. The "rate of economic growth" refers to the geometric annual rate of growth in GDP between the first and the last year over a period of time. Implicitly, this growth rate is the trend in the average level of GDP over the period, which implicitly ignores the fluctuations in the GDP around this trend. An increase in economic growth caused by more efficient use of inputs (such as labor productivity, physical capital, energy or materials) is referred to as intensive growth. GDP growth caused only by increases in the amount of inputs available for use (increased population, new territory) is called extensive growth. 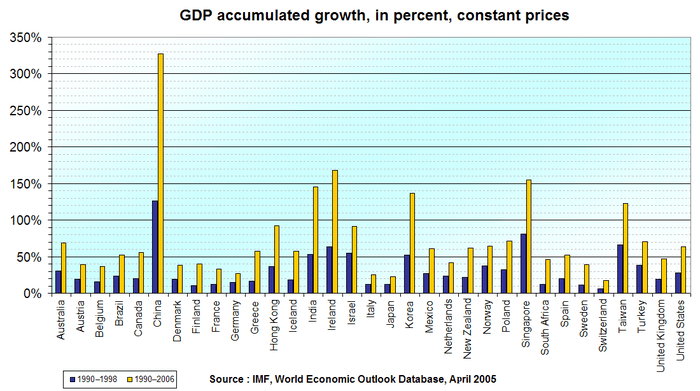 The economic growth rate is calculated from data on GDP estimated by countries´statistical agencies. The rate of growth of GDP/capita is calculated from data on GDP and population for the initial and final periods included in the analysis. (Note: There are various measures of productivity. The term used here applies to a broad measure of productivity. By contrast, Total factor productivity (TFP) growth measures the change in total output relative to the change in capital and labor inputs. Many of the cited references use TFP.) Increases in productivity lower the real cost of goods. Over the 20th century the real price of many goods fell by over 90%. Economic growth has traditionally been attributed to the accumulation of human and physical capital and the increase in productivity arising from technological innovation. In economics and economic history, the transition to capitalism from earlier economic systems was enabled by the adoption of government policies that facilitated commerce and gave individuals more personal and economic freedom. These included new laws favorable to the establishment of business, including contract law and laws providing for the protection of private property, and the abolishment of anti-usury laws, When property rights are less certain, transaction costs can increase, hindering economic development. Enforcement of contractual rights is necessary for economic development because it determines the rate and direction of investments. When the rule of law is absent or weak, the enforcement of property rights depends on threats of violence, which causes bias against new firms because they can not demonstrate reliability to their customers. Capital in economics ordinarily refers to physical capital, which consists of structures and equipment used in business (machinery, factory equipment, computers and office equipment, construction equipment, business vehicles, etc.). Up to a point increases in the amount of capital per worker are an important cause of economic output growth. Capital is subject to diminishing returns because of the amount that can be effectively invested and because of the growing burden of depreciation. Another major cause of economic growth is the introduction of new products and services and the improvement of existing products. New products create demand, which is necessary to offset the decline in employment that occurs through labor saving technology. Criticisms of classical growth theory are that technology, the most important factor in economic growth, is held constant and that economies of scale are ignored. Robert Solow and Trevor Swan developed what eventually became the main model used in growth economics in the 1950s. This model assumes that there are diminishing returns to capital and labor. Capital accumulates through investment, but its level or stock continually decreases due to depreciation. Due to the diminishing returns to capital, with increases in capital/worker and absent technological progress, economic output/worker eventually reaches a point where capital per worker and economic output/worker remain constant because annual investment in capital equals annual depreciation. This condition is called the steady state. In the Solow-Swan model if productivity increases through technological progress, then output/worker increases even when the economy is in the steady state. If productivity increases at a constant rate, output/worker also increases at a related steady-state rate. As a consequence, growth in the model can occur either by increasing the share of GDP invested or through technological progress. But at whatever share of GDP invested, capital/worker eventually converges on the steady state, leaving the growth rate of output/worker determined only by the rate of technological progress. As a consequence, with world technology available to all and progressing at a constant rate, all countries have the same steady state rate of growth. Each country has a different level of GDP/worker determined by the share of GDP it invests, but all countries have the same rate of economic growth. Implicitly in this model rich countries are those that have invested a high share of GDP for a long time. Poor countries can become rich by increasing the share of GDP they invest. One important prediction of the model, mostly borne out by the data, is that of conditional convergence; the idea that poor countries will grow faster and catch up with rich countries as long as they have similar investment (and saving) rates and access to the same technology. The Solow-Swan model is considered an "exogenous" growth model because it does not explain why countries invest different shares of GDP in capital nor why technology improves over time. Instead the rate of investment and the rate of technological progress are exogenous. The value of the model is that it predicts the pattern of economic growth once these two rates are specified. Its failure to explain the determinants of these rates is one of its limitations. Although the rate of investment in the model is exogenous, under certain conditions the model implicitly predicts convergence in the rates of investment across countries. In a global economy with a global financial capital market, financial capital flows to the countries with the highest return on investment. In the Solow-Swan model countries with less capital/worker (poor countries) have a higher return on investment due to the diminishing returns to capital. As a consequence, capital/worker and output/worker in a global financial capital market should converge to the same level in all countries. Since historically financial capital has not flowed to the countries with less capital/worker, the basic Solow-Swan model has a conceptual flaw. Beginning in the 1990s, this flaw has been addressed by adding additional variables to the model that can explain why some countries are less productive than others and, therefore, do not attract flows of global financial capital even though they have less (physical) capital/worker. Growth theory advanced again with theories of economist Paul Romer and Robert Lucas, Jr. in the late 1980s and early 1990s. Unsatisfied with the assumption of exogenous technological progress in the Solow-Swan model, economists worked to "endogenize" technology in the 1980s. They developed the endogenous growth theory that includes a mathematical explanation of technological advancement. This model also incorporated a new concept of human capital, the skills and knowledge that make workers productive. Unlike physical capital, human capital has increasing rates of return. Research done in this area has focused on what increases human capital (e.g. education) or technological change (e.g. innovation). One popular theory in the 1940s was the Big Push, which suggested that countries needed to jump from one stage of development to another through a virtuous cycle, in which large investments in infrastructure and education coupled with private investments would move the economy to a more productive stage, breaking free from economic paradigms appropriate to a lower productivity stage. The idea was revived and formulated rigorously, in the late 1980s by Kevin Murphy, Andrei Shleifer and Robert Vishny. Schumpeterian growth is an economic theory named after the 20th-century Austrian economist Joseph Schumpeter. The approach explains growth as a consequence of innovation and a process of creative destruction that captures the dual nature of technological progress: in terms of creation, entrepreneurs introduce new products or processes in the hope that they will enjoy temporary monopoly-like profits as they capture markets. In doing so, they make old technologies or products obsolete. This can be seen as an annulment of previous technologies, which makes them obsolete, and "...destroys the rents generated by previous innovations." (Aghion 855) A major model that illustrates Schumpeterian growth is the Aghion-Howitt model. According to Acemoğlu, Simon Johnson and James Robinson, the positive correlation between high income and cold climate is a by-product of history. Europeans adopted very different colonization policies in different colonies, with different associated institutions. In places where these colonizers faced high mortality rates (e.g., due to the presence of tropical diseases), they could not settle permanently, and they were thus more likely to establish extractive institutions, which persisted after independence; in places where they could settle permanently (e.g. those with temperate climates), they established institutions with this objective in mind and modeled them after those in their European homelands. In these 'neo-Europes' better institutions in turn produced better development outcomes. Thus, although other economists focus on the identity or type of legal system of the colonizers to explain institutions, these authors look at the environmental conditions in the colonies to explain institutions. For instance, former colonies have inherited corrupt governments and geo-political boundaries (set by the colonizers) that are not properly placed regarding the geographical locations of different ethnic groups, creating internal disputes and conflicts that hinder development. In another example, societies that emerged in colonies without solid native populations established better property rights and incentives for long-term investment than those where native populations were large. Eric Hanushek and Dennis Kimko introduced measures of students' mathematics and science skills from international assessments into growth analysis. They found that this measure of human capital was very significantly related to economic growth. Eric Hanushek and Ludger Woessmann have extended this analysis. Theodore Breton shows that the correlation between economic growth and students' average test scores in Hanushek and Woessmann's analyses is actually due to the relationship in countries with less than eight years of schooling. He shows that economic growth is not correlated with average scores in more educated countries. Hanushek and Woessmann further investigate whether the relationship of knowledge capital to economic growth is causal. They show that the level of students' cognitive skills can explain the slow growth in Latin America and the rapid growth in East Asia. For more details on Energy efficiency, see Productivity improving technologies (historical) § Energy efficiency. One theory that relates economic growth with quality of life is the "Threshold Hypothesis," which states that economic growth up to a point brings with it an increase in quality of life. But at that point – called the threshold point – further economic growth can bring with it a deterioration in quality of life. This results in an upside-down-U-shaped curve, where the vertex of the curve represents the level of growth that should be targeted. Happiness has been shown to increase with a higher GDP per capita, at least up to a level of $15,000 per person. For more details on this topic, see Business cycle. For more details on this topic, see Economic inequality. A 1999 review in the Journal of Economic Literature stated that high inequality lowers growth, perhaps because it increases social and political instability; however, changes in the degree of inequality have a relatively minor effect on growth. Research by Harvard economist Robert Barro, found that there is "little overall relation between income inequality and rates of growth and investment". According to Barro, high levels of inequality reduce growth in relatively poor countries but encourage growth in richer countries. Princeton economist Roland Benabou's research shows that inequality does not matter per se to growth, but "inequality in the relative distribution of earnings and political power" does matter. Although resource depletion in the past has been addressed by technological advances and substitution, emergent environmental and physical constraints may limit economic growth. 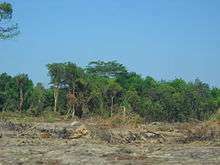 Forest in Indonesia being cut for palm oil plantation. On the other hand, British conservative politician and journalist Nigel Lawson claimed that people in a hundred years' time would be "seven times as well off as we are today", therefore it is not reasonable to impose sacrifices on the "much poorer present generation". In 1972, the The Limits to Growth study modeled limitations to infinite growth; originally ridiculed, these models have been validated and updated. ↑ Wang, Ping (2014). "Growth Accounting" (PDF). p. 2. ↑ Krugman, Paul (1994). "The Myth of Asia's Miracle". Foreign Affairs. 73 (6): 62–78. ↑ Lucas, R. E. 1988. "On the mechanics of economic development," Journal of monetary economics, 22(1), pp. 3–42. ↑ Ayres, Robert U.; Warr, Benjamin (2004). "Accounting for Growth: The Role of Physical Work" (PDF). ↑ Field, Alexander (2004). "Technological Change and Economic Growth the Interwar Years and the 1990s". ↑ Gordon, Robert J. (2000). "Interpreting the "One Big Wave" in U.S. Long Term Productivity Growth, National Bureau of Economic Research Working paper 7752". 1 2 Gordon, Robert J. (Spring 2013). "U.S. Productivity Growth: The Slowdown Has Returned After a Temporary Revival" (PDF). International Productivity Monitor, Centre for the Study of Living Standards. 25: 13–9. Retrieved 2014-07-19. The U.S. economy achieved a growth rate of labour productivity of 2.48 per cent per year for 81 years, followed by 24 years of 1.32 per cent, then a temporary recovery back to 2.48 per cent per cent, and a final slowdown to 1.35 per cent. The similarity of the growth rates in 1891–1972 with 1996–2004, and of 1972–96 with 1996–2011 is quite remarkable. ↑ Dale W. Jorgenson; Mun S. Ho; Kevin J. Stiroh (2008). "A Retrospective Look at the U.S. Productivity Growth Resurgence". Journal of Economic Perspectives. Retrieved 2014-05-15. 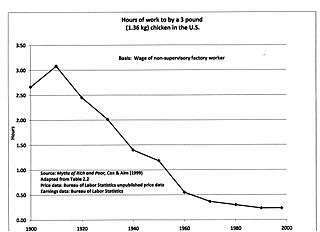 ↑ "Hours of Work in U.S. History". 2010. ↑ Whaples, Robert (June 1991). "The Shortening of the American Work Week: An Economic and Historical Analysis of Its Context, Causes, and Consequences". The Journal of Economic History. 51 (2): 454–7. ↑ Acemoglu, Daron; Robinson, James A. (2012). Why Nations Fail: The Origins of Power, Prosperity, and Poverty. United States: Crown Business division of Random House. p. 43. ISBN 978 0 307 71922 5. ↑ Li, Rita Yi Man, and Li, Yi Lut (2013) "The relationship between law and economic growth: A paradox in China Cities," Asian Social Science, 9(9): 19-30. ↑ Robert M. Solow (1956), "A Contribution to the Theory of Economic Growth," Quarterly Journal of Economics, 70(1), p pp. 65–94. ↑ Elhanah Helpman, The Mystery of Economic Growth, Harvard University Press, 2004. ↑ Quote from Philippe Aghion, 2002, Schumpeterian Growth Theory and the Dynamics of Income Inequality, Econometrica, 70(3), 855–82. • Also see Wendy Carlin and David Soskice, 2006, Macroeconomics: Imperfections, Institutions & Policies, specifically chapter 14. ↑ • Philippe Aghion and Peter Howitt, 1992, A Model of Growth Through Creative Destruction, Econometrica, 60(2), 323–51. Philippe Aghion, 2002, Schumpeterian Growth Theory and the Dynamics of Income Inequality, Econometrica, 70(3), 855–82. ↑ Daron Acemoğlu, Simon Johnson and James A. Robinson.The Colonial Origins of Comparative Development: An Empirical Investigation. American Economic Review 91(5): 1369–401. 2001. Sala-i-Martin, Xavier, Gernot Doppelhofer, and Ronald I. Miller. 2004. "Determinants of long-term growth: A Bayesian Averaging of Classical Estimates (BACE) approach." American Economic Review 94, no. 4 (September): 813–35. • LudRomer, Paul. 1990. "Human capital and growth: Theory and evidence." Carnegie-Rochester Conference Series on Public Policy 32: 251–86. ↑ Barro, Robert J., and Jong-Wha Lee. 2001. "International data on educational attainment: Updates and implications." Oxford Economic Papers 53, no. 3 (July): 541–63. 1 2 Breton, Theodore R. 2015. "Higher Test Scores or More Schooling? Another Look at the Causes of Economic Growth", Journal of Human Capital, v9, n2, 239–63. ↑ • Hanushek, Eric A., and Ludger Woessmann. 2008. "The role of cognitive skills in economic development." Journal of Economic Literature 46, no. 3 (September): 607–68 . • Hanushek, Eric A., and Ludger Woessmann. 2011. "How much do educational outcomes matter in OECD countries?" Economic Policy, 26, no. 67: 427–91. ↑ Devine, Jr., Warren D. (1983). "From Shafts to Wires: Historical Perspective on Electrification, Journal of Economic History, Vol. 43, Issue 2" (PDF): 355. ↑ Kaldor, Nicoals, 1955, Alternative Theories of Distribution," Review of Economic Studies, 23(2), 83–100. ↑ Alesina, Alberto and Dani Rodrik, 1994. "Distributive Politics and Economic Growth," Quarterly Journal of Economics, 109(2), 65–90; Persson, Torsten and Guido Tabellini, 1994, "Is Inequality Harmful for Growth?" American Economic Review 84(3), 600–21. ↑ Galor, Oded and Joseph Zeira, 1993, "Income Distribution and Macroeconomics," Review of Economic Studies, 60(1), 35–52. ↑ Perotti, Roberto, 1996, "Growth, Income Distribution, and Democracy: What the Data Say" Journal of Economic Growth, 1(2), 149–87. ↑ Temple, J (1999). "The New Growth Evidence" (PDF). Journal of Economic Literature. 37 (1): 112–56. doi:10.1257/jel.37.1.112. ↑ Jaccard, M. 2005 Sustainable Fossil Fuels. Cambridge University Press. 1 2 "Chapter 17: Growth and Productivity-The Long-Run Possibilities". Oswego.edu. 1999-06-10. Retrieved 2010-12-22. 1 2 Regis, Ed. "The Doomslayer". Wired. ↑ Hayward, Steven F. "That Old Time Religion". AEI. Retrieved 2010-12-22. Grier, Kevin (2008). Empirics of Economic Growth. The Concise Encyclopedia of Economics (2nd ed.). Library of Economics and Liberty. ISBN 978-0865976658. OCLC 237794267. Romer, Paul M. (2008). Economic Growth. The Concise Encyclopedia of Economics (2nd ed.). Library of Economics and Liberty. ISBN 978-0865976658. OCLC 237794267. Research and Degrowth network Academic association dedicated to research, awareness raising, and events organization around the topic of degrowth.